One of the old school _forgotten vegetables_, the jerusalem artichoke is one of my favourites. 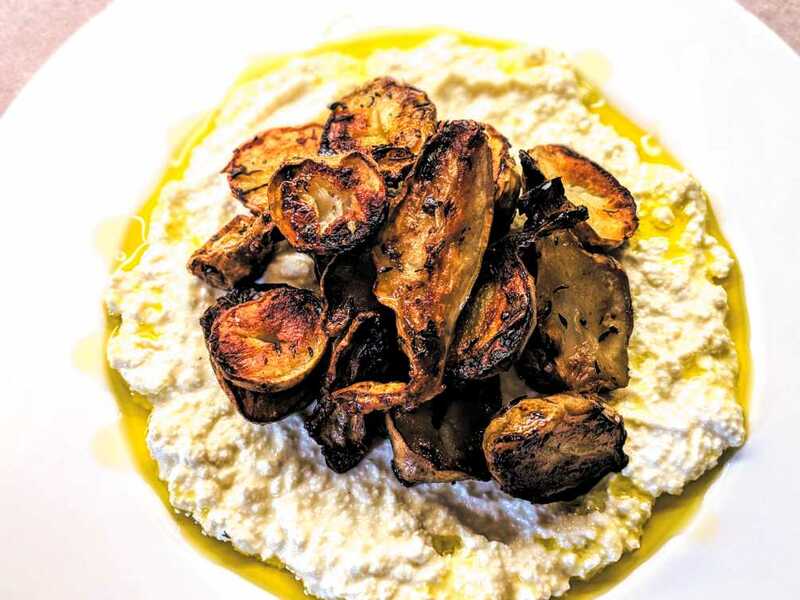 Roasting them until they're crisp and caramelised, almost blackened, brings out the sweetness in this humble root, and it just happens to go really well with some homemade ricotta, made soft by mixing some of the whey back into it, and a generous glug of best quality extra virgin olive oil. It's excellent served simply with some nice bread. The method for making the ricotta is exactly the same as my [existing recipe](https://www.grubdaily.com/ricotta). You will need muslin (cheesecloth) or a clean tea-towel to strain the cheese. --- * 1 kg jerusalem artichokes, washed * 1.25 litres whole milk * 1 lemon, juiced * 2 cloves of garlic * 1 sprig of thyme * sea salt and freshly cracked black pepper * vegetable oil, for cooking * fine quality extra virgin olive oil 1. Firstly, make the ricotta. Combine the milk and lemon juice in a large pan and slowly heat to around 83C (it doesn't have to be exactly precise, but definitely don't let it boil). The curds will begin to separate from the whey. Hold at this temperature for 15 minutes. Meanwhile, dampen and fold your muslin into 5-6 layers (a single layer will do if you're using a tea-towel). Carefully Ladle the curds onto the muslin and bring the corners together to hang. Drain in the fridge for 1 hour. When cool, mix some of the whey back into the cheese to make it soft, and season to taste with sea salt. 2. Heat the oven to 200C and place a roasting tray in to get nice and hot. Slice the artichokes in half. When the oven is hot, remove the tray and place over a medium flame on the hob. Add 2-3 tablespoons of vegetable oil and wait 30s for it to heat up, then add the artichokes along with a generous pinch of sea salt, a little cracked black pepper, the whole garlic cloves and thyme. Stir-and-fry for around 2 minutes, until the artichokes are starting to get a bit of colour on them. Now place the tray in the oven and roast for about 40 minutes, tossing a couple of times, until they're dark and caramelised. It might take longer, depending on your oven. 3. To serve, spoon the softened ricotta onto the plate, and place the roasted artichokes in the middle in a heap. Drizzle a good amount of olive oil over the whole plate. Serve with crusty bread.